Affirmation: Life leads me through doorways that awaken my heart, mind and soul. It is safe for me to walk through. I am filled with great waves of joy for the love life shows me. I love walking through that doorway. Behind it is the most magical garden forest and sacred space full of beautiful art. The artist, Dave, who lives there and built that doorway, travels overseas to South East Asia every winter to work with the monestaries and orphaned children. Our life is filled with so many doorways that open and close. I have found the more I opened the doorways in my soul the more I found amazing magical places like this both internally and externally. Take some time today to go inward and see where the doorways to your soul open. Then take time to see what they reflect on the outside to. I bet they are breathtaking. 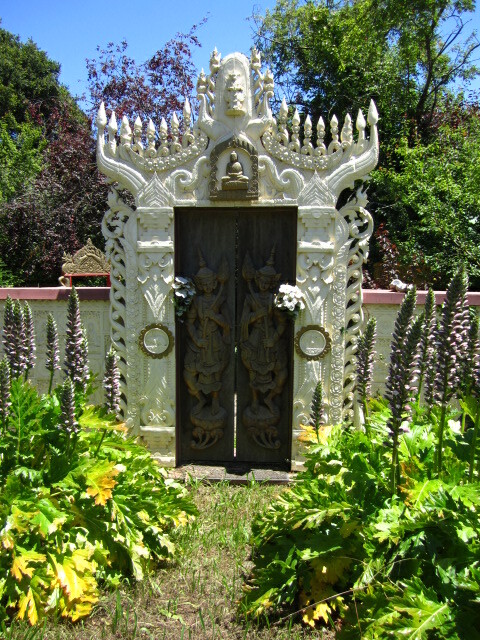 This entry was tagged affirmation, art, body, Bolinas, doorway, garden, life, mind, soul, spiritual. Bookmark the permalink.